This edition of how to avoid spending money you don’t have to is brought to you from the future, specifically tomorrow (thanks International date line!). For the past few weeks I (Chris) have been on the road for work, which has its pluses and minuses. On the plus side, I enjoy going places I’ve never been and “putting faces to names”. On the minus side being away from the ‘Zoo can be a bit lonely and the food is just not nearly as good. I suppose another plus is that these longer flights (14 hours!) give me time to make up for being way behind on my post count for the KaZoo blog (more importantly way behind on the I promised Amy to write these articles list). So without too much more rambling on, let’s talk about the always exciting subject of …… buying eggs! Back when I interned at NASA (why yes I was an actual rocket scientist), I met a man named John (also a rocket scientist) who taught Tai Chi and lunch and never failed to give me advice on how to live “better”. One of his soapbox items was high quality eggs and the difference they made (let’s just say he really loved eggs). Just to clarify, the eastern shore of the DelMarVa pennisula was a major chicken producing area so eggs were plentiful (even the good ones) so it wasn’t hard or that pricey to get good eggs. Fast forward to that fall and I am pretty sure I was one of the only college kids willing to pay double or more for “good” eggs for my homemade omelets, which were a collage staple for me. An unintended benefit of getting the good eggs was that my then girlfriend (now wife) loved those omelets and still does….right Amy? Anyway, I know there are lots of news articles and blog posts on eggs and which ones are the best. For now, I’m going to forgo that subject for now and just address grocery store eggs (and by grocery store I mean Publix and the Whole Foods in the “city” since WF has not yet decided to grace the “beach” with it’s presence –just announced last week WF is coming in 2015!!). One thing that is easy to notice is that there are some huge price differences in eggs depending on everything from color, size, egg type, how the chicken’s are raised, chicken feed type, and a whole host of different things. 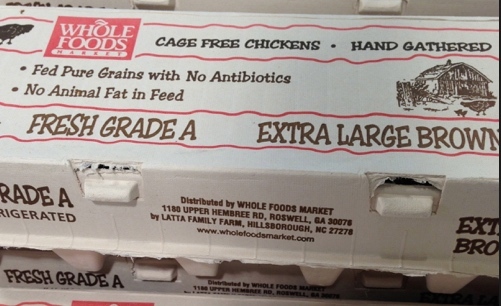 For example, Publix branded regular large white eggs were roughly $1.59 a dozen whereas heirloom hen, organic, cage free eggs were $3.99 a half dozen (aka $8 a dozen!). Since I wasn’t ready to drop $8 a dozen for heirloom eggs and we lived relatively close to a Whole Foods, I decided to add Eggs to the list of things to get when I made a Whole Foods run. Something this (all?) Whole Foods tried to emphasize was local and regionally sourced foods including the eggs they sell. Of course they, like everyone else, charge quite a premium for the “nicer” local and regional eggs. Since I am all about good eggs, I am not opposed to paying a little more, but I try to make sure that I am actually getting something for my money. To get a better feel for what I was paying for, I started reading labels specifically to see where the eggs were from, which meant that I soon realized that anyone buying the “regional” eggs were making a pricey mistake. The regular Whole Foods large, brown eggs were $2.79 a dozen while the “local” eggs from “Willow Farms” were a surprisingly competitive $3.25 a dozen. However, if you wanted the “regional” eggs from Latta’s Egg Ranch (with Omega 3s) those were $4.99 a dozen! Upon closer inspection of the regular Whole Foods eggs, I found that Whole Foods had contracted with Latta’s Egg Ranch for their “regular” eggs. This means that both the Whole Foods and Latta’s Egg Ranch “regional” eggs were from the same place despite the difference in price. So…semi-pro tip #1 from the KaZoos: Always read the fine print on where your eggs are coming from. Semi-Pro tip #2: Always check the egg section for new selections. Our local “beach” grocery now carries eggs from Vital farms, which are really good!